The Weather Channel has since released a short documentary telling of the study’s findings. 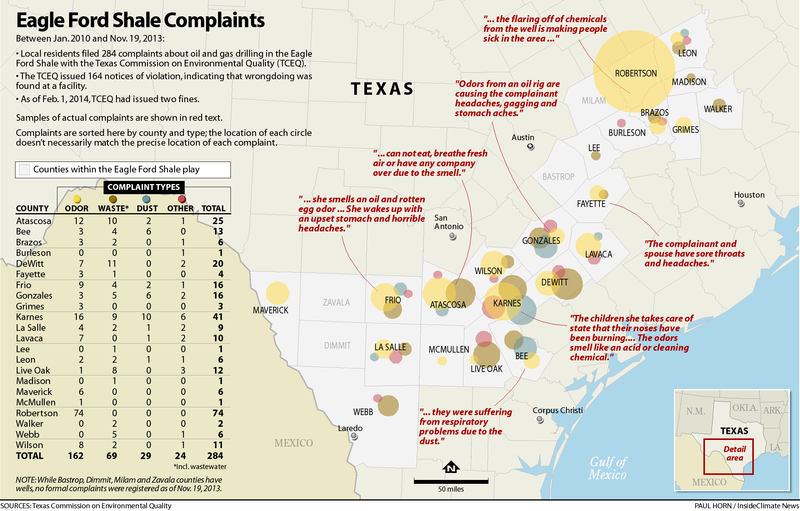 Original Post: A new study by the groups InsideClimate News, the Center for Public Integrity, and The Weather Channel examines the Eagle Ford Shale in Texas. It’s a 400-mile-long swath of oil and gas extraction from East-Central Texas to the Mexico border. Since 2008, more than 7,000 wells have been sunk with another 5,500 approved. The study criticizes air monitoring in the state and enforcement rates of infractions. Of 284 complaints, Eagle Ford residents filed in a recent four-year period, only two resulted in fines despite 164 documented violations. According to the report, Texas lawmakers have cut the state’s budget for environmental regulation since the Eagle Ford boom began, from $555 million in 2008 to $372 million in 2014. Since 2009, the number of unplanned toxic air releases associated with oil and gas production increased 100 percent statewide. We spoke with Lana Straub, our reporter in the Permian Basin, about the groups behind the study, and what they found. This entry was posted in KRTS News and tagged Eagle Ford Shale, Fracking, Oil and Gas, South Texas, Texas Commission on Environmental Quality. Bookmark the permalink.